While there are many books I’ve read in the last few years and thoroughly enjoyed, it’s rare that I read something and feel as if I had been missing something amazing for years and years, and felt a desire to kick myself for taking so long to get around to something. Because I feel like I’ve learned something about the world, reading this novel: something desperately important and something we have forgotten, to our own peril. I first read Jack Womack’s word in 2000 or 2001 — I’d say probably the latter, just before I left Canada for Korea — and it was the novel Ambient, a sort of love story trapped in the middle of a power struggle within a megacorporation called Dryco, set in a world where human life is valued so little it is hard to fathom. The book was gritty and hard, or that’s how I remember it, but I also remember thinking very highly of it, so highly in fact that when my friend Joleen asked me if she could send me anything to read (reading materials being scarce in my part of Korea back then), I specifically mentioned Womack. Among the other books she sent me were copies of two other Dryco books, Heathern and Terraplane, though for some reason I never got around to reading them… until now, that is. They are on my list now, along with Elvissey, though I want to reread Ambient and read Womack’s other work as well. They’re all next on my list. Because Random Acts of Senseless Violence is that good. Which isn’t to say it’s not bleak. It traces the collapse of a city (and, presumably, a nation); of a family; of a girl’s life, all at once. A world where the army occupies New York City, and civilians riot and gangs kill with effective impunity. A world where child prostitution is clearly far from unusual (though not actually described, in this book at least), and where vestiges of civilization remain, if just barely– like the private school that the protagonist, Lola, manages to attend despite her family’s poverty, for much longer than I imagined. But also a world where everything is suddenly scarce, and turning scarcer, and the only job her father can find is slaving 80 hours a week for a sociopath running a bookstore. A world that is tearing apart pretty much on a daily basis, and becoming something else. It’s heartbreaking, and dark, and harsh. But it’s also an amazing book. I’d say Womack is right in saying it’s the book to start with, if you want to make sense of the other books in the series. After all, when I read Ambient — the first book published in the series — I found it hard to believe the callousness and cruelty of the world it was set in. But this book does a lot to sketch in the details, and well, it’s a little chilling how much of what’s in this novel is has begun, slowly, to materialize out there in the real world. Sure, the person who posted this Russia Today video is a crank, and the Marines aren’t patrolling the streets of NYC right now as far as I know. But I also know that in 2001, I was shocked (on arriving Korea, post-9/11), to see for the first time machine guns borne by security in the airport; but now, when I see such weapons (or military personnel) in an airport, I am no longer shocked. I was shocked when a friend who’d been at the protests during the FTAA talks in Quebec City described police forces tear-gassing families and senior citizens engaged in peaceful protest; now, I’m surprised when they don’t engage in such idiotic brutality, and cops are more and more being equipped with the kind of gear that we’d expect in a science-fiction military adventure narrative — body armor, high powered guns, and so on. But it’s not, of course, that Womack has zeroed in on the future of 1995 (our present) itself: one might be tempted to accuse him of hiding a time machine somewhere in his home — and of knowing things we don’t yet know — but that’s not it, not it at all. All of that is incidental, mappable from the disaster zones of 1995, and a distraction from the more remarkable thing about Random Acts. And that more remarkable thing is Womack’s acute awareness of something that most of us, living in our relatively insulated, comfortable first-world lives, have mostly happily and conveniently forgotten: that as fraught and problematic as modern, American-styled civilization as we know it is, it’s better and safer outright fundamentally different for most of its inhabitants than the world we had before it, and it’s also a very fragile, breakable thing. Not fragile or breakable in the sense that we need men with guns to protect it, that we need to surrender all of our freedoms to maintain it; but in the sense that it is a very large and complex system, and any number of dangers — economic collapse, social unrest, and the heavy hand of military suppression, but also corporate greed and the stratification of society — pose threats to its stability. That many of the things we take for granted as unsolvable problems are the very things that threaten the foundation of the system as a whole. When I describe a book as “painful” I usually mean it is bad, but in the case of Random Acts… I mean that it is hard to imagine a reader who would not experience a kind of acute emotional pain while reading the book. Part of this, certainly, has to do with Womack’s choice of narrator: it’s one thing to see modern American civilization (such as it is) collapse into a horrific, starving, bloody, violent mess… and quite another to see it through the eyes of a twelve year old middle-class girl. For Random Acts… is written in the form of the diary of one such girl. As the situation in America worsens, so does her family’s situation, and their desperate, terrifying fight to stay above water is described by her in vivid detail. 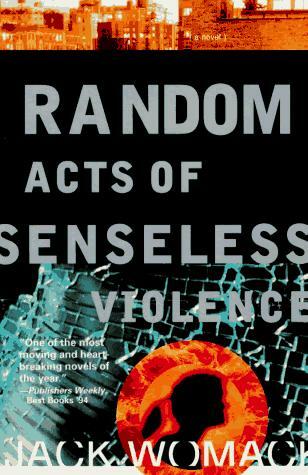 In a sense, Random Acts of Senseless Violence is the story of a transformation: how an America like the one we all know from movies and TV, and which many of Womack’s readers know from their daily lives, could be transformed into the hellish, inhumane mess we see in the other Dryco books. It is a vision of America becoming, overnight, a third world nation driven mad by its inability to accept that transformation, and by the mixture of some of those first world values surviving, and others of them not surviving. The transformation is something we watch on a number of levels at once: the personal, as Lola (the narrator) changes from a sweet, innocent tweenish girl writing in relatively standard English, to an argot-spouting, dangerous young woman who is adapted to survive — as much as anyone can, and without the aspiration to actually live — in the world she finds herself in; the familial, as Lola’s family is torn apart at the seams; and New York City, which likewise collapses utterly as we, the horrified reader, watch; and America, of course. Lola is rendered pitch-perfectly, in my opinion: not too precocious, but also not underestimated. The future-slang felt, as usual, only very slightly awkward to me, but by the end of the book didn’t strike me as anything except itself, because the progression Lola makes from middle-class all-American girl to an inhabitant of a dystopia is so smooth and believable. It reflects the shift in her mentality, going from only slightly harsh to our ears (such as when she says of her parents’ hometowns, L.A. and Chicago, “They’re horrible places and I’m glad they’re burning down…”) to the final brutal pages, where our hearts shatter under the weight of all that happens. All fiction lies between the poles of playful simulation of utopian (i.e. radically better) relationships and ideological explanation as to why relationships are as they are and can change only for the worse. As a rule, utopian presentation has to be explicit since it presents an alternative, while ideological presentation will best be served by remaining implicit, as an unargued premise that this is how things are, were, and will be. Both the cognitively utopian and the mystifying horizons are intimately interwoven in most stories, often in the same paragraph or indeed the same sentence. If this is true for all literature, it is most evident in the case of paraliterature (“popular” or “mass” fiction), which does not reduce this constant tension to the straitjacket of individual psychology and experience. On the contrary, paraliterature deals with the tension set up between the utopian and ideological horizons in more or less openly communal, collective terms. In this way, “popular” narrative–and in particular, SF narrative–can be considered as the concealed truth of all modern literature, that battleground of understanding and mystification. Elkins and Suvin are talking about the tension between the just-so story of why the world is the way it is now, and why it ought to stay that way — the “ideological” and “bourgeois” side of the binary, which “mystifies” the status quo — and the utopian vision of radical otherness, of something radically better, which politically challenges that just-so story. Suvin and Elkins argue this is a tension present in all literature, but more evidently in “popular” fiction and most especially in SF. The world of Random Acts is absolutely not utopian, of course; it is outright dystopian, in fact; but its relationship to our world is complex if we’re looking at things through this binary of Suvin and Elkins’. Is Womack positing the comfortable world of 1995 America as utopian by contrast with the Dryco world — that is, is the book implicitly utopian and bourgeois at the same time, because it seems to offer the collapsing, horrific world of Lola (which resembled many other places in our real world at that time, and still does) as a contrast to our better, happier world? Is the dystopianism of Lola’s world somehow inherently bourgeois in its implicit praise of our own world? That doesn’t seem quite right to me either, though it raises very interesting and important questions about precisely what we’re doing when we’re reading (or telling) stories set in alternate worlds. But if we step back and look at the genre of Lola’s narrative, we find that Random Acts is a bildungsroman — a novel of growing up — but one inverted from the normal logic of the form. It is the bildungsroman of the apocalypse, a bildungsroman that, at its core, contains a bullet with the name of that bourgeois, just-so story inscribed on its side. In a normal bildungsroman, the child learns those just so stories and becomes a functional member of a functional society that somehow looks eternal, unchanging, that is finally normative. But in Random Acts, the lessons the child learns as she “grows up” are lessons we ourselves did not have to learn, and lessons we want to refuse to believe she must or even could learn. And yet, she does learn them, and while those lessons may not be the right ones (her fate in a later book in the series, Ambient, leaves that question open, as do some comments her friend Iz makes) it’s clear that the lessons we’d like her to learn are not useful or viable in this world. After all, she is adapting herself to the wreckage of the world she was born into, after it has had its brains beaten out in the streets. For all the wisdom and intelligence we’d like to think we readers have accumulated, Lola’s world is one that would be likely to chew up and spit out most of us without a moment’s pause. To which I say: maybe you will find yourself thinking about some of those things. Maybe you won’t have any choice. And maybe, just maybe, you will reach the point where you have no choice precisely because you refused to think about those things until they were upon you. Most who watch this Youtube video seem to feel an inkling of something, perhaps a sense of hope or wonder, of anger and desire to go to that place that Chaplin describes. And then we go back to our daily lives. It is almost a clichéd sentiment now, for us — and this is a perilous state, but it bears considering that while Chaplin’s sentiments are comprehensible to us now; after all, for vast stretches of human history, in most cultures, such sentiments would have been utterly baffling. People occasionally rose up in rebellion against an unjust leader, but not for the reasons Chaplin mentions, not with the goals Chaplin describes, not with those ideals. I strongly suspect a number of those ideals do not predate the Enlightenment, and a number of them indeed are very twentieth-century. Not eternal, not universal. Those values, and the world in which they are possible, can be dismantled, thrown away, broken beyond repair, or lost. And Womack’s novel shows us how it can happen — on every level from the individual to the national. It’s disquieting enough that at the end of the book, I realized it wasn’t only Lola who had lost her innocence — in some way, I had lost mine, too. An innocence I’d forgotten I had, or perhaps an innocence I’d been lulled into forgetting I’d been entertaining all this time. I am convinced that — more than the insufficient press, the cover art, the title, or how it didn’t fit the zeitgeist when it was published, the four reasons Jo Walton suggested the book never became recognized as a masterpiece — the main reason is the fact that the book is a truly painful wake-up call. To read Random Acts is not to read a bildungsroman, it’s to experience one yourself. It’s not an adventure; it’s not fun; it’s not a ripping good yarn. Real futurism means staring directly into your own grave and accepting the slow but thorough obliteration of everyone and everything you know and love. … except maybe not so slow as all that. That obliteration could be a mere paycheck away, and it may be the one thing most fantastical about speculative fiction is how denialist is has been about this fact: its comfortable catastrophes, its visions of the world somehow getting from here to some wondertech future sort of like now but more wondertechy. The absence of many compelling visions of how it might not be like that; the broad failure to look at places like real-world Russia, or South Korea in the 1960s, or Argentina Chile under Pinochet, and say, yeah, it could happen to us too. Hell, forget Korea in the 1960s — some of this book reminded me of South Korea in 2012. Not a lot, but some. So of course it could happen in New York City. Of course. Does this sound like a lot of fun? Just don’t expect it to move a lot of product. Most people really don’t want to be reminded of how precarious our world is. They don’t want to look at Russia today, or Liberia, or even the America of Bush, the America of Obama (or, even less so, the Clintonian America into which the book was first published), and be reminded that, yes, it can happen here. They surely don’t want to be told that if they choose to just plunk along like everyone else, they are subject to terrifying, possibly horrible, horribly possible things. That, surely, is crackpot. It doesn’t help that crackpots get off on imagining it. But just because they do, doesn’t mean it can’t happen. It has happened in plenty of places. Read up on what Burma was like a hundred years ago, if you don’t believe me. To realize this is to grow up, in a sense: to recognize your own responsibility to that shared, consensual reality we take for granted. I can’t help but think of a few people I know who are intelligent, but who for some reason aren’t willing to think about, or talk about, issues. For doing that job, we all owe him thanks. And while I could go on, for there are questions that remain for me regarding this book, I’ll stop and just tell you what you already know you should do: read this book. 1. Actually, to be honest, there were parts of this story that made me think of things I’ve seen in South Korea. For one thing, the interchangeability of police and military being employed as riot police in protests (however bizarre) being suppressed in Seoul; the power of employers to work people insanely long hours (by far the longest hours in the OECD); the relatively lower value put on human life (especially in the case of migrant laborers, but also just in general); a lack of sensitivity to mental health issues (mental hospitals being basically prisons in many parts of the country, and crazy people (like both Crazy Lola and Mister Mossbacher) being left to wander around freely; a callousness towards questions of the sexual abuse of children and women in general (the criminal justice system lond has been notoriously weak and unethical here in dealing with such crimes, especially in assaults by adult men on underage females); the corruption of business (such as the “garbage dumplings scandal” which is something I can see Dryco happily doing); and most important, the sense of powerlessness among the populace. I’d never say that South Korea actually resembles the Dryco world — I think Jack Womack is right that post-Soviet Russia is much more like that — but I think if the book were translated, not everything that shocked Western readers would necessarily come across as quite as shocking to Korean readers. I’ve seen bosses like Mr. Mossbacher before here. I’ve known people being worked 80 hours a week. I’ve seen the downtown turned into encampments of riot police and protesters, with violence on both sides. I’m saying if there’s a spectrum between the world of Random Acts and Ambient on one end, and the idealized consensus reality of America (especially circa 1995, when this book was published) on the other, Korea lies in a different place along that spectrum. I can’t help but wonder what a reader in Moscow, or in Monrovia, Liberia — places that strike me as much more like the New York of the Dryco books — would make of it. Interesting points — but it was Chile that had Pinochet. Argentina was under a military junta (arguably more barbaric still) from 1976 to 1983. Argh, you’re right. Thanks for the correction. I’m starting to feel like all the wires in my brain are hopelessly crossed, and things I would never have goofed on in the past are coming out all wrong now, even stuff I’d swear I know. Didn’t know about the Argentine military junta specifically, not that I’m surprised by it either. Great post, Gord, and I love Random Acts of Senseless Violence, as well (and yeah: it was ahead of its time. But if you truly think most modern SF isn’t about what *could* happen in the worst sense of the word, then you’ve missed about 95% of what’s published, and filmed. Dystopia, gloom’n’doom and apocalypse rule the waves. Seriously: the Hunger Games shattered box office records). But, for the love of all my German masters, it’s *bildungsroman*, not ‘bildungromans’ (even wikipedia knows it: http://en.wikipedia.org/wiki/Bildungsroman ). First off, thanks, damn, a typo I always make with bildungsroman — I even did it just now. I have no idea why, but my brain rebels against putting an s the middle of a word like that. Stupid North American Englishie. Anyway, I’ve fixed it. You’re right that a lot of modern SF presents things that could happen in the worst sense of the word… but that “could” is technical in a sense, because of how many narratives comfort us in the face of that supposed the worst case scenario by treating it as if it’s some highly unlikely (or not-as-bad-as-it-could-be) sort of event. It’s sort of the outgrowth of the “comfortable catastrophe” idea… except we’re more sophisticated now, and do that consolatory trickery in different ways these days. In a sense, when you have alienated your audience from the dystopian possibility, no matter how possible it is, you’ve somehow cushioned its effects. Setting it so far along a chain of maybes that we would be unlikely to live to see it is one example of a way of alienating people from the possibility of your worst case scenario. (Which I suspect is what is going on with The Hunger Games, though I don’t know much about the story, just the gist; it’s still in my to-read pile; the film won’t be out till sometime next week, I guess, and being that this is Korea, it may not be around long — or may rake in the dough…) Another way is to resolve it too easily, like by sending knuckle-dragging miners to change the asteroid’s path, or having a bunch of emo-rocker looking scientists “reboot” the sun, or high school kids fight off the USSR’s best, or… well, you get the picture. You’re right that plenty of modern SF involves worst case scenarios, but it’s often a backdrop for adventure, more than being “about” the worst case scenario the way this novel is. I don’t think most of those stories really take their scenarios all that seriously; in fact, I think not taking such scenarios seriously is probably a necessity for your narrative to get a big following, because it’s too horrifying otherwise… like Random Acts, which, despite being wonderfully-written, is really emotionally difficult to read at points. Or maybe the apparent sense of realism I got from the book is just contextual, since with Occupy and the American economy as it is, if you squint hard it looks much more like Max Headroom’s tagline: “20 Minutes Into the Future” than anything else out there.